For many people taxes are one of the largest expenses in their yearly budget, if not the largest expense. With proper planning it doesn’t have to be this way. Our tax system is way more complicated than it needs to be and this complication often leads to people paying more in taxes than they should have to. I have spent the last few years refining my personal tax strategy. In 2015 we earned $72,000 but actually received more money back in federal taxes than what we paid in. There are no secrets to optimizing your taxes it just takes an understanding of the tax codes and the incentives that are built in to it. 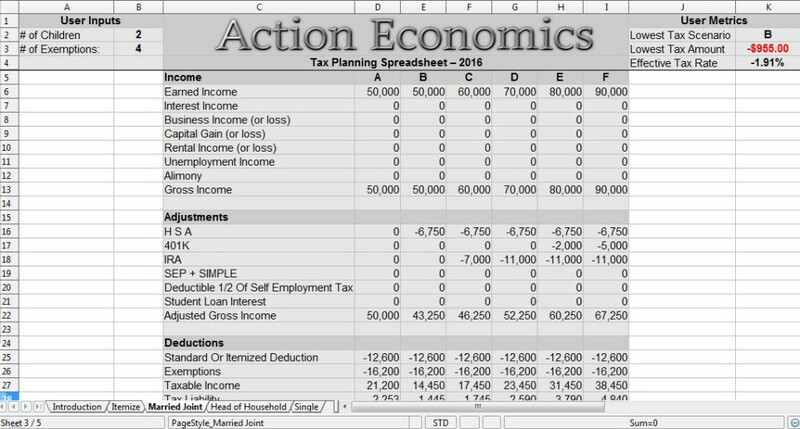 I built a tax planning spreadsheet to assist with planning federal income taxes. My tax planning spreadsheet allows the user to compare multiple tax scenarios side by side. It will calculate out federal taxes owed, social security and medicare taxes, and will even calculate the retirement savers tax credit and the child tax credit. The spreadsheet will then select from the different scenarios you input which is the lowest cost scenario. The spreadsheet is extremely user friendly and has literally saved me thousands of dollars by helping me reduce my taxes. Click here for a video overview of the spreadsheet. 401K contributions: 401K contributions are tax deferred savings that is saved before tax and taken right out of your paycheck by your employer. The maximum contribution is $18,000 per person per year. Taxpayers over age 50 can contribute an extra $6,000 per year. Solo 401K: A solo 401K is great because you can contribute a much higher cap than with an employer based IRA. The true cap for 401Ks is $53,000 per year. Effectivle you contribute as both an employee and as an employer. IRA contributions: IRA contributions have a limit of $5,500 per year. Some people are able to contribute to both a 401K and an IRA, depending on income level. Taxpayers over age 50 can contribute an extra $1,000 per year. HSA contributions: HSA contributions are limited to $6,750 per year for a family plan or $3,350 per year for an individual plan. Taxpayers over 55 can contribute an extra $1,000 to an HSA. HSA contributions made directly through an employer are also deductible from Social Security and Medicaire tax. Flexible Spending Accounts: These accounts are limited to $5,000 per year per family and have a use it or lose it policy. Funds may be used for certain medical and child care purposes. Only $500 can be carried over from 1 year to the next. After these funds are taken out you arrive at your Adjusted Gross Income (AGI). Your AGI is the number that is used to calculate any obamacare subsidies you may qualify for. Increasing these contributions can go a long way to reducing the cost of health insurance you are faced with. Here’s the bonus: Most states base your state income tax owed off of your Adjusted Gross Income. This provides extra incentive to lower this number as well. Your AGI is also used to determine if you qualify for certain tax credits. All taxpayers can choose between taking the standard deduction, or itemizing deductions. This number is subtracted from your AGI, along with $4,000 per person for standard exemptions, to determine your taxable income. This is the figure that the graduated tax brackets are applied to. Mortgage Interest on a primary and secondary property with a max of $1 million of debt. Note: All of these itemized deductions are to be claimed in the year they are paid, not necessarily when they are due. Therefore it may make sense to group itemized deductions together and take the standard deduction every other year, by doing things like paying property taxes in advance. Tax Credits are awesome because they reduce your tax bill dollar for dollar. The Retirement Savers Tax Credit is my favorite tax credit, designed to help lower income people save for retirement. Mrs. C. and I receive a $400 retirement savers tax credit each year. The maximum credit is $1,000 per person for a married coule with an AGI of <$37,000. Child Tax Credit/Additional Child Tax Credit: Most workers who earn over a few thousand dollars a year and have children under 18 will qualify for either the child tax credit or the additional child tax credit. My tax planning spreadsheet will calculate this for you. The credit max is $1,000 per child. The child tax credit is non-refundable while the additional child tax credit is refundable. Earned Income Credit: The Earned Income Credit is perhaps the largest ant-poverty program in the US. The credit climbs up in value as the worker earns more money, then plateuas across a range of several thousand dollars of income, then gradually reduces. The number of child dependents grealty influences the amount of Earned Income Credit. The maximum Earned Income Credit for 2016 is $6,269 for a household with 3 or more children with earned income for a married couple between $14,000 and $24,000. Click here for a link to an EIC calculation. The Earned Income Credit is a refundable tax credit. American Opportunity Tax Credit: The American Opportunity Tax Credit is a tax credit that makes college much more affordable. The credit is worth $2,500 per year for a max of 4 years. There is a $1 for $1 credit for the first $2,000 spent, then a 25 cents per $1 credit for the next $2,000 spent. Up to 40% of the credit is refundable. Using this credit it is easy in many areas to earn an Associates degree at no cost. Credit For Child and Dependent Care: This tax credit is based on both income and expenses incurred. This credit can offset the cost of daycare from 20% to 35% depending on income level. The credit takes the first $3,000 of child care expenses per child into account, with a total max of $6,000. Residential Energy Credit: This is a big one here. Currently the federal government will give an UNLIMITED 30% tax credit on wind, solar, and geothermal home installation. Systems installed through 2019 will receive the 30% tax benefit, while systems installed in 2020 will received a 26% tax credit and systems installed in 2021 will receive a 22% credit. 2021 is scheduled to be the last year the credit is in place for residential installations. With the complexity of our tax code it is necessary to compare all the different options you have to see if it makes sense to go after certain incentives in order to reduce your tax bill. Keep in mind there is more to personal finance than just lowering your taxes and it may make sense to pay a little more in taxes than to base your entire life off of getting the lowest tax bill. If you are serious about lowering your federal income taxes check out our tax planning spreadsheet as a tool to assist in your planning. Yes, it is possible to reduce your property taxes. Most municipalities allow you to contest the assessment on your property yearly. I have contested assessments 3 times and have received major reductions each time. Sometimes property is taxed too high due to administrative error. In Michigan for example primary homeowners pay substantially less in taxes than people who own a second home or rental property. Double check your property tax statements to ensure that your primary residence and any adjacent parcels are listed as 100% homesteaded. Prevention is actually much easier than correction when it comes to reducing property taxes. Property taxes are always based on the value of the home, so looking for a modest, less expensive home will save you proportionally on property taxes over the long run. Property tax rates can also vary considerably from township to township. In my county there are 86 different areas that charge different tax rates, ranging from 0.9% to 2.3% of the value of the home. Look into these tax rates before buying and you could save thousands of dollars per year. What steps have you taken to reduce your tax burden? 6 Responses to "Reduce Taxes"
Hey John, just wanted to suggest that catch up contributions for 401K and IRAs are allowable after age 50, per https://www.irs.gov/retirement-plans/plan-participant-employee/retirement-topics-catch-up-contributions. Maybe the laws changed since this article was posted? Great blog–I look forward to following your story as it unfolds. One thing I appreciate most is that you haven’t made it to FI yet (and also don’t make $250K a year), so I can relate to where you are at. Thank you Mike, you are correct, I updated the article to reflect the correct age at which catch up contributions are allowed. Hello my name is sean , I Just found your Blog recently and love it. 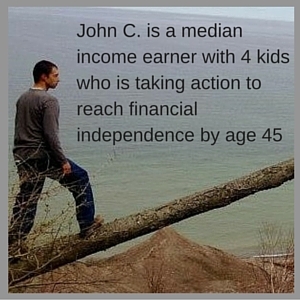 Finally someone around the same income as my family and is making FI possible and writing about it.. I seen you have some spreadsheets like and want to get them.. I noticed the Tax planning one is updated for this year, is the other updated … 2014 year is that the last one.. I really been looking for the Tax Planning i think is going to be a BIG help.. Is the one link to purchase all 3 of them, if so what do i search.. Thanks for your help in advance and will looking forward to future posts.. Thanks Sean! I’m glad you’re enjoying the blog. I sent some more details on the spreadsheets to you on Facebook. hi very impressed with spreadsheet. my question is: the “itemize” category tab looks like a tally… can you add “detail” sub-categoy(s) data tabs to caculate into itemize tab? kindly email with any questions you may have. many thanks. Yes, if you downloaded the spreadsheet you could add additional rows to breakdown your itemized deductions further.